An angsty teen novel about a serious issue. Willow killed her parents in a car crash seven months ago and lives with her brother and his new wife and baby. Trying to get through life with this burden on her shoulders has driven her to cut herself with a razor blade on her arms and legs. A boy at her school finds her secret out and she must walk a fine line to keep it safe. This book was very serious and very stark. The tone is dead, with sparse words and sharp dialog, reflecting Willow's inner pain. 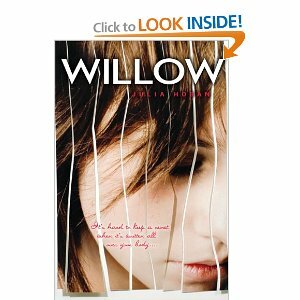 For me, Willow was hard to like. She snaps at people, pouts through school and her job, and tries to drive away the one boy that really cares about her. She's been through such tragedy that you wonder if she's too broken to be fixed. What I did like about this book was the way Julia Hoben portrayed the reasons why Willow cut herself and what goes on in her head to make her go to such extremes. It was a great insight into the pain that these people carry with them and really opened my eyes. I recommend this book to anyone looking for a dark drama. Great review. It does sound dark!